I’m livid right now and I mean LIVID! I’m trying to comprehend how some people can be so cold-blooded. I was sitting at work and I overheard a coworker talking about the catastrophic earthquake in Haiti. When most people talk about the earthquake they are saying “what can I do”, “how can I help” or “I can’t imagine that happening to my family”. She’s not the nicest person so I knew none of those words were going to come out of her mouth but at the same time I didn’t expect what I heard. I only caught bits and pieces of the conversation, but it was enough to piss me off to the point where I had to walk out. (It was either walk out or go off and possibly lose my job) On my way out the door I ran into another one of my coworkers who actually heard the entire conversation and she too had to walk out. This heartless, poor excuse for a human had the audacity to say the people of Haiti are sitting around waiting on “Handouts” and they should “Help Themselves”. I’m floored right now….seriously, what human, forget race, could look at those pictures, see all those bodies in the road, see the devastation and still say they should “Help Themselves”? HOW? They’re already doing everything they can just to stay alive. But I guess that’s not enough in her eyes. Oh, so I suppose they asked for the earthquake? Yes that’s it, they wanted their homes destroyed, and they wanted to lose their family and friends, just so they could get a “Handout”? She can’t be serious…. I honestly can’t believe the nerve. I’m still trying to figure out how when one of my other coworkers recently lost her brother and her mother less than a week apart she (the heartless one) was running around here, like a chicken with its head cut off, trying to get us to give donations to the other coworker “because it’s so sad and tragic”, but Haitians just want “handouts“????? Hmmm so let me get this right… when two people in one family unexpectedly die its “sad and tragic” and we should “do what we can to help”, but when thousands of people die we shouldn’t do anything because they just want “handouts”? Yeah, that makes perfect sense….NOT! I’m trying not to make this an issue of race but in all honesty that’s what it boils down too. Had this happened in a place that was predominately white I don’t think, matter fact I know, she wouldn’t have said anything like that. She would have been the first one sending out emails asking for donations, ooohing and ahhhing over the photos, and acting like she’s so heartbroken by all the little helpless kids that have lost their parents. I need ya’ll to pray because I’m about 5 seconds away…Matter fact I’ll pray…Lord please give me the strength to make it through this day without going off on her. I’ve ignored several of her other racist comments. When she said that she told her daughter it was okay to call a black person a n****r if that’s how they were acting I was still cordial towards her (Only because I didn’t actually hear it myself). When she stated that people that went to Fayetteville State University probably couldn’t even spell “soccer”, I bit my tongue…Then I wore my North Carolina Central University T-shirt to work, hoping she would say something about my school…Lord, I don’t want to be the token black chick, the one that’s quick to go off or that’s overly sensitive about issues related to race, but this woman has pushed every button I have. My parents said I have one “get out of jail free card” I just may end up using it on her. I can’t take much more of her ignorance. Wooo Saaaaahhhh Ok ya’ll I just did something that made me feel 10 times better. 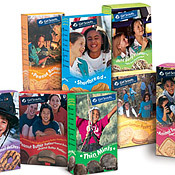 I had ordered some Girl Scout cookies from her daughter but I sent her an email which stated “In wake of this tragic earthquake I would like to do my part and send as much money as I can to the Red Cross and other relief agencies. With that being said, I have to cut back in areas that aren’t necessities.” I doubt she responds but in my eyes her daughter is just someone who wants a handout and she’s sitting around waiting on her mommy to sell her cookies. I can hear ya’ll now, Rachelle you can afford cookies and to donate…you’re right, I can…but I think I’ll take my business elsewhere! I choose not to include any pictures from this devastating earthquake because I can’t bare to look at them. Previous Post Time Will Tell….’Cause I’m Not! Next Post School’s in Session! That is sad. I actually feel like I should pray for her too because she is just plain ignorant (and she doesn’t know she has a token black chick ready to stomp her down nearby). Lord help her. Wow, I couldn’t have said it better, thanks for not going off, but this one, I would have given you free and you still keep your get of jail free card. The ignorance of people, contiue to pray my child. Well I think by writing this post, it helped you to release some of your anguish towards Ms. Heartless! Someone of that morale isn’t even worth getting your feathers ruffled over. From what you’ve stated, she obviously needs some divine intervention! Oh but I do like how you reneged on the Girl Scout Cookies. That was a good one! I can hear your frustration when I read this, Chelle. Trust me, I probably would’ve done the opposite and talked to her right then and there which, off emotion, wouldn’t have been the best thing. Sometimes though, people need to be confronted in their ignorance and presumption. We saw this with Katrina – this heartlessness and lack of compassion due to the suffering – and it just boggles my mind that people don’t, for a second, attempt to put themselves in someone’s shoes before they make judgments on what that person is or isn’t or should and shouldn’t do in the wake of a crisis. I don’t know if she had all or any of the facts, but her and Pat Robertson need some monstrous servings of humble pie. I just watched the CBS Evening News with Katie Couric and she had me crying! I am getting more upset the more I think about what your coworker said. I started thinking like Eric, that you should say something to her. It seems that she keeps making ignorant comments because no one is checking her on it. She should at least know that it is NOT okay to say things like that at the workplace when it makes others uncomfortable. I don’t think you should have done it today, but Monday when you are a little more calm, you should think about doing it. You know what… I must start this off by saying I am very proud of you for being able to not do the “black girl” thing. (A statement that I have heard from my chain of command in the Army) You’ve grown. You also have to realize that her character is a product of how she was raised. Ignorance is still among us, unfortunately….. All we can do as a nation, and as a people, is pray for her and others like her. And lets not forget to pray for our children like our ancestors prayed for us that they wont have to deal with the level of ignorance that we have to. In my honest opinion, if this lady has made racial slurs and has shown blatant racism, even in wake of a DISASTER, I think its time for you and some co-workers to come togetherand make a little complaint. And another ig… remember something Apostle Davis used to say… When you can no longer pray for someone, its time to pray about them. She NEEDS to be prayed about. And I’ll help. One of my coworkers sent an email to our supervisor filling her in on EVERYTHING (not like she didn’t already know, but now she can’t deny it) We’re waiting to see what gets done! But in the meantime, I’ve already written an email for her and the next time she comes out of her mouth sideways she will be getting it. It’s very tackful but at the same time gets the point across! So either way, something is being done! Thanks for your prayers because I needed them Friday.